I finally found the answer to my breastfeeding problem. I produced not that much of breast milk, with my first child I only breastfed her for one week and then she's into formula milk. Problem before was, baby doesn't know how to latch and that my milk wasn't enough for her. Hence the very short time of breastfeeding her. This time around, I told myself that I will breastfeed my second child up to 2-3months if I can. Good thing my mom asked the pharmacist about some drugs that can help produce more breast milk, aside from the regular malunggay leaves. 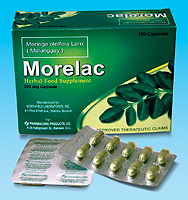 The pharmacist recommends Morelac capsules. To be taken 2-3 times per day every after meal. But for me I just took it once per day, preferably morning after breakfast. It really worked wonders on my breast. Provided that I drink more fluids within the day.